AS delegates and exhibitors from around the world descend on Dubai at the end of April for the Arabian Travel Market (ATM), the growing eastward shift of inbound markets to the GCC will become ever more apparent. In keeping with recent years, ATM2019 is expected to have a distinctly Chinese flavour, with even more exhibitors from the Asian country attending than 2018, when numbers doubled year-on-year. News that Chinese delegates are coming to ATM in ever greater numbers reflects the market. A January 2019 report, commissioned by the show organisers, predicts that the GCC will welcome 2.9 million Chinese tourists in 2022, almost double the 1.6 million who visited in 2018. Closer political and economic ties between the two regions - not least one of the most ambitious international trade and investment schemes on the planet - is already playing its part in supporting this growth. Launched in 2013 by Chinese president Xi Jinping, the Belt and Road Initiative (BRI) essentially recreates the east-west trade corridors of the ancient Silk Road. The BRI aims to stimulate trade, investment and economic growth through 65-plus countries in Europe, Asia and Africa (and including the six GCC countries) which account for roughly two-thirds of the world’s population. For the GCC travel and tourism trade, the spin-off benefits of this paradigm shift in global trade and investment could be immense. Skirting Hong Kong International Airport, and clearly visible from the cable car, which whisks tourists up and across the hills of Lantau Island to the popular Ngong Ping Village and Tian Tan Buddha, the Hong Kong-Zhuhai-Macao bridge stretches as far as the eye can see across the South China Sea. Opened last October, it is, at 55 km long, a spectacularly impressive feat of engineering. It is also a high-profile element of the vast infrastructure development scheme steadily transforming the socio-economic landscape of Hong Kong, Macau and Guangdong Province, otherwise known as the Greater Bay Area. 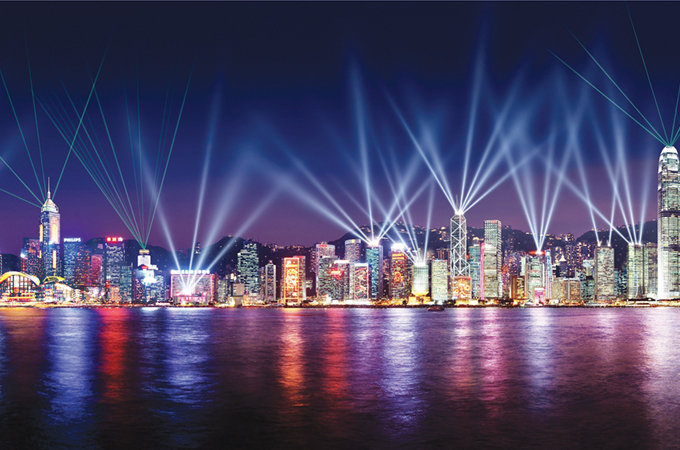 At the Hong Kong International Tourism Convention last December, Hong Kong Chief Executive Carrie Lam underlined the strategic importance of the BRI in the Greater Bay Area, and its r ole in boosting international tourism. “Developing people-to-people bonds is one of the five connectivity’s pertaining to the Belt and Road Initiative,” she told the international audience, which included TTN. “And we believe that tourism exchange is a powerful means of promoting such bonds. “Multilateral co-operation is no less central to the Belt and Road Initiative and to tourism development. Easing visa regulations, expanding flight connections, enhancing cultural co-operation - these and other considered measures can only help boost tourism and the rewards they offer us all,” she added. Lam pointed out that Hong Kong already runs one of Asia’s largest hospitality and tourism schools, which could help serve other countries along the ‘Belt and Road’ on tourism infrastructure developments, as well as training professionals for the tourism industry. In the Greater Bay Area itself, various BRI-related infrastructure projects promise to open up new horizons for tourists long familiar with the ‘east-meets-west’ charms of cosmopolitan Hong Kong, but perhaps less so with the city’s near neighbours. Suggesting that the Greater Bay Area has the means to rival Tokyo, San Francisco and New York in tourism potential, Lam noted during the December convention that the region’s offerings are “wide ranging and undeniably inviting”. With the new bridge and high-speed rail links, the world-famous entertainment capital of Macao, and the rich Chinese culture and heritage of the Bay’s nine mainland cities are now more accessible than ever before. Hong Kong itself will, of course, be a prime beneficiary of the BRI. Last October its government, in a tourism development blueprint, stated that it would seek to offer tourism products with international and local characteristics; promote smart tourism; enhance its service quality and diversify visitor source markets. In the latter point, GCC markets will likely have important roles to play in the success of the blueprint. Connectivity will be key. The capacities and global reach of the Gulf’s carriers and airport hubs is well documented (and will be equipped to handle growth in inbound markets). Similarly, Hong Kong is also one of the world’s best-connected facilities, Chep Lap Kok currently serving more than 70 million passengers a year, and 220 destinations. A major expansion underway will ramp up capacity to 100 million passengers annually by 2024. Much political and financial capital is now being invested in the BRI, and among the many economic sectors in 65-plus countries, the tourism industries of the GCC and southern China are set to reap fresh rewards. And increased Chinese participation at ATM 2019 is yet another telling barometer of potential which is now being realised, even if, in many respects, the journey on the New Silk Road has only just begun.